Due to our small batches we have the flexibility to brew a large range of beers. 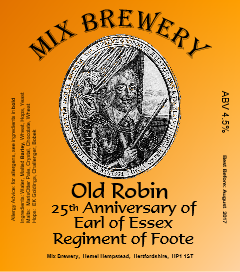 Proprietor and brewer, Mick Harrison, has been brewing for over 30 years. Due to demand from friends and work colleagues to be able to buy the range of beers a decision was made to turn commercial. By still using the small kit, brew length is tiny at only 70lt, allows us the flexibility. We have been brewing commercially for 3 years now and slowly built a core range of beers that are usually available throughout the year. The remainder of the beer offering will be varied with an exciting range of colours, flavours and aromas. Due to our small batch we can even brew to order for those special occasions and will even help you create your own unique beers. Just get in touch to discuss that special beer for that special occasion. We recently produced a custom brew for a group of Civil War Enthusiasts. 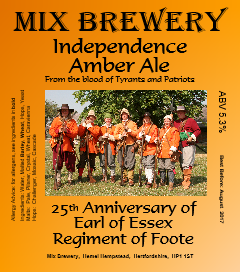 The Earl of Essex Regiment of Foote celebrated their 25th Anniversary in August. 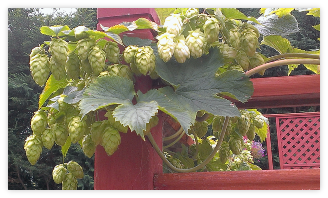 We currently grow two hop varieties on site, Fuggles and Bramling Cross, both of which are used in our beers.